ANDREW PENNY – NOW AND THEN! his directing of ensembles, as well as his exceptional support to me as Director of Music, will be greatly missed. for advice! Margaret Pearson is a superb teacher and accompanist and will bring many good qualities to the department – we have been lucky to secure her and many thanks again to Andrew for his big part in arranging this. 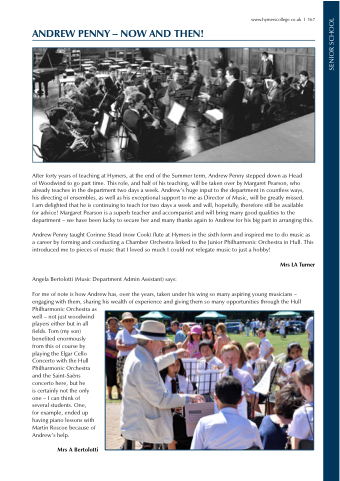 Andrew Penny taught Corinne Stead (now Cook) flute at Hymers in the sixth form and inspired me to do music as a career by forming and conducting a Chamber Orchestra linked to the Junior Philharmonic Orchestra in Hull. This introduced me to pieces of music that I loved so much I could not relegate music to just a hobby! for example, ended up having piano lessons with Martin Roscoe because of Andrew’s help.